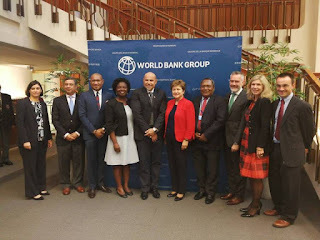 Engagement with the World Bank and International Monetary Fund, that will stimulate positive economic development in the face of global challenges, has been advanced at meetings in Washington D.C. by the Deputy Prime Minister and Treasurer, Hon. Charles Abel MP. Deputy Prime Minister Abel said the new submarine fibre optic communications cable project, that will deliver cheaper and faster Internet, and the provision of concessional financing for the restructuring of existing debt, will deliver positive economy stimulus for the economy. “Papua New Guinea has a close working relationship with the World Bank and IMF, and the benefits of this engagement will become even more obvious to our people with the delivery of cheaper and faster Internet. “Working with the World Bank, and also our partners in Australia, the new submarine communications cable will deliver greater Internet access for Papua New Guineans. “The new communications cable will make the Internet we received on our computers and smart phones much faster, and with the increased supply we will see Internet data prices fall. “Increased access to the Internet is essential if we are to advance Papua New Guinea’s economy and improve service delivery. "The submarine cable has been the subject of much discussion in recent years, and now we are moving ahead so that it will be in place ahead of the APEC Summit. "The time given to our country by the World Bank and IMF executive for meetings in Washington was tremendous. "I took the opportunity to remind them of the particular circumstances of Papua New Guinea and the Pacific small island states. "I said PNG has globally significant natural assets to build a new, responsible, sustainable economy that brings inclusive development to its people but also can support climate change mitigation globally. "We are confronted with our immediate development challenges and are also on the frontline of the effects of climate change." The Deputy Prime Minister said discussions with the World Bank on restructuring existing debt with concessional funding will further simplify debt that has been established over recent decades, and reduce servicing costs. "Papua New Guinea has never defaulted on a debt payment, and this is respected by global institutions such as the World Bank and the International Monetary Fund. "We are in talks with the World Bank and IMF so that we can bring together a number of scattered debts and consolidate these under a single debt facility at a much more favourable interest rate. Deputy Prime Minister Abel was accompanied by Treasury Secretary, Dairi Vele, and the Governor for the Bank of Papua New Guinea, Loi Bakani. As well as the main Plenary Sessions of the World Bank Meeting, the DPM participated on 3 panels, including a panel with the World Bank CEO, and the Finance Ministers for Indonesia and Serbia, on Asia and the Growing Middle Class and Inclusive Development. The DPM also had 15 meetings including separate meetings with CEO of the World Bank, Kristalina Gregorieva, Asia Pacific Director, Victoria Kwakwa, and Australian Treasurer, Scott Morrison.